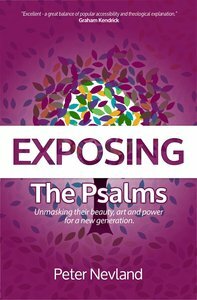 The introduction of this book encourages readers to 'mind the gap' between the distant ancient culture of the psalmists and our current world. The author outlines his method of interpreting the psalms (a nine-step interpretive process) before proceeding to explore 30 of the 150 psalms. The book has an unusual design - more like a montage of comments than a commentary in the traditional sense. It doesn't examine the selected psalms in their canonical order, but starts with Psalm 45, goes to 85, then to 23, then to 100, 24, and so on. Each commentary on the psalm is followed by a poem written by the author - a kind of lyrical exploration of some of the ideas in the psalm, which is, of course, itself a lyrical medium. As a writer, teacher, performer and speaker, Peter Nevland's words excite, captivate, ignite and inspire. He's toured 5 continents, producing 7 CDs, 2 DVDs, 2 books and more than 700 poems since he left his engineering job at Motorola in 2002 to pioneer the art of Spoken Groove. When he's not preaching in churches, performing in theatres, teaching his How to Write workshops or writing ads to grow small businesses, you'll find him and his wife, Victoria, at their home in Austin, Texas.